I read this article and found it very interesting, thought it might be something for you. The article is called Over 17 years, Same 5 States Hobble Sanitation Mission and is located at https://archive.indiaspend.com/cover-story/over-17-years-same-5-states-hobble-sanitation-mission-42130. Uttar Pradesh, Bihar, Madhya Pradesh, Odisha and Jharkhand are the worst performing states under the Swachh Bharat Mission (SBM), which will celebrate its second anniversary on October 2, 2016, with fanfare. No more than 23% households in these five states use toilets, as on September 28, 2016, an increase of only 2% over 15 years, according to government data. 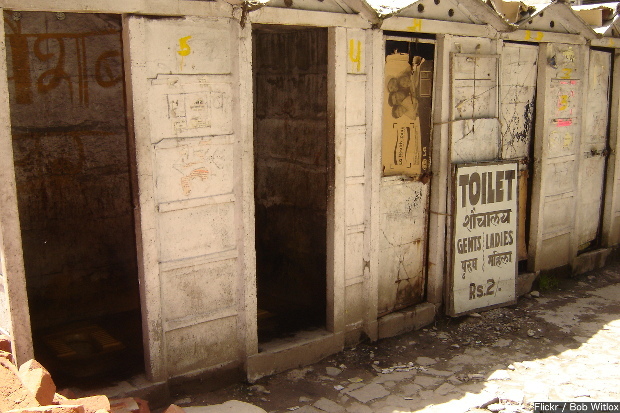 They say history repeats itself; this seems to be ringing true for India’s sanitation programmes. The worst-performing states under the SBM are the same as they were under the Total Sanitation Campaign, launched 17 years ago by NDA-1—the first time the National Democratic Alliance came to power. The United Progressive Alliance government that followed changed the name of the campaign to Nirmal Bharat Abhiyan (Clean India Campaign) and increased it to 607 districts. Together, these states account for 37% of India’s 1.2 billion people: 448 million people live in UP, Bihar, MP, Odisha and Jharkhand—only China with 1.3 billion has more people than these five states. Without headway here, the SBM is not likely to succeed. As many as 23 million toilets have now been built across the country, which means 55% of Indian households had toilets (till September 28, 2016), up from 42% in 2014. As many as 1,536 villages have been declared open-defecation free, up from 697 in 2014; as many as 23 districts are open-defecation free, up from seven districts in 2014. Bihar had the lowest proportion of households with toilets in 2016: 25%, which is an improvement from 22% in 2014, according to government data. 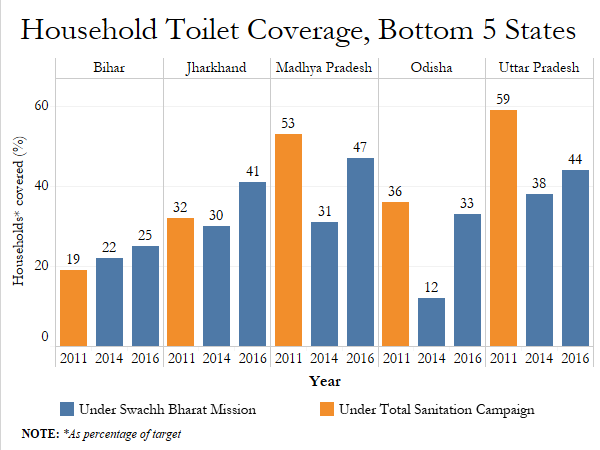 Odisha reported an increase in the proportion of households with toilets, from 12 % in 2014 to 33% in 2016, the largest increase among the bottom five states, but it is still it below the national average of 55% households with individual toilets. Odisha also reported the largest proportion of households practicing open defecation (77%), followed by Bihar (76%) and Jharkhand (64%), according to this answer given to the Lok Sabha (lower house of parliament) by the minister of sanitation in February 2016. No more than 19% of households in Bihar had toilets under earlier sanitation campaigns, followed by Jharkhand with 32%. More than 91% of households practiced open defecation in Jharkhand in 2011, followed by Madhya Pradesh (86%) and Odisha (84%). These states–UP, Bihar, MP, Odisha and Jharkhand—received45% of the national budget for sanitation programmes, IndiaSpend reported in October 2012. The main reason for sanitation failures in these states is the lack of information and education on sanitation, especially in MP, where large swathes of land are inhabited by tribals. Up to 21% of MP is tribal, who speak at least seven languages, while the literature provided by the government is in Hindi, according to this 2015 report by the Comptroller Auditor &General (CAG).